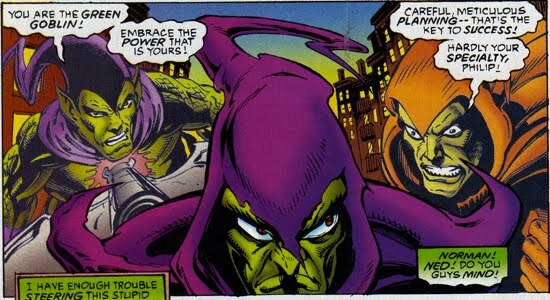 With three out of the four known Goblins "dead," the Clone Saga ushered in a new type of Green Goblin, a heroic Goblin. Of course Harry Osborn had done some 'heroic' things whilst wearing the Green Goblin attire, but the fourth Green Goblin was the first one to attempt making a career out of heroism with his newfound powers. 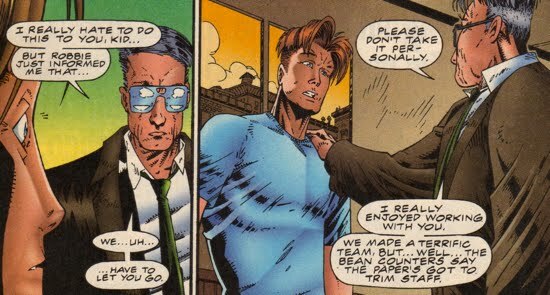 Phil Urich, nephew of investigative reporter Ben Urich, was working as an intern at the Daily Bugle and aiding his uncle in the research for his new book “The Dynasty of Evil”. The book was an expose on the history of the Green Goblin, and it ulimately indicted Norman Osborn. In Green Goblin #1, Phil, in act of poor judgement, told his friend Fast Freddie Glazer the location of a potential Goblin Hideout. Freddie then told a local thug, aptly named Ricko the Sicko, who then brought his crew to the site. Freddie and Phil ended up going to the hideout because Ricko wanted to thank Phil personally. Unaware of the ransacking, Ben Urich went to investigate the hideout seperately. Ricko’s gang spotted Ben and threatened to kill him. Phil intervened and in the process of rescuing his uncle he stumbled onto a new Goblin technology that Harry had been working on prior to his “death”. He and his uncle split up and Phil curiously investigated the Goblin lair. While perusing the hideout a rat jumped out at him, which caused him to fall back into a glass containment unit, holding the Goblin Formla. The glass shattered causing the formula to come pouring over Phil. In order to avoid Ricko and his gang, Phil donned a Goblin costume and glider and fled the hideout. He escaped but was not sure what he should do with all this Goblin equipment. He soon decided to fight crime with this forgotten Goblin technology. 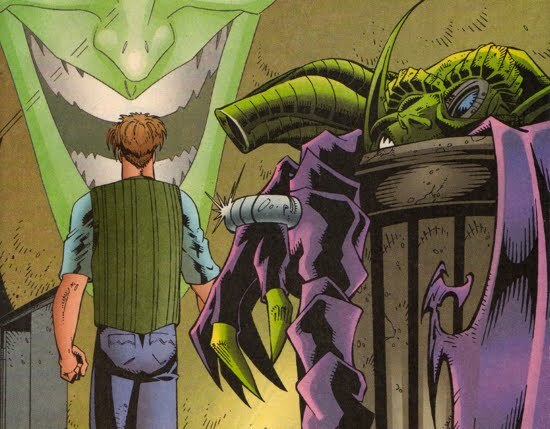 In Green Goblin #5, Phil began having second thoughts about taking up the mantle of the Green Goblin. Whether it was from his brief stint as the Goblin or from his uncle’s book, Phil had nigtmares involving all the former Goblins. 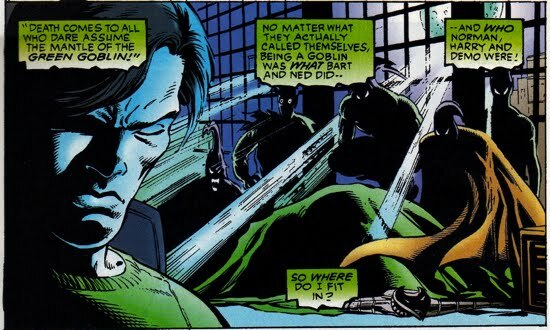 Norman, Harry, Bart, Ned, and the Demogoblin were all featured and their take home message to Phil, “Death comes to all who assume the mantle of the Green Goblin”. Phil was determined to “beat the odds” and these “whispers” in the back of his mind were crucial to his crusade to do good as the Goblin. 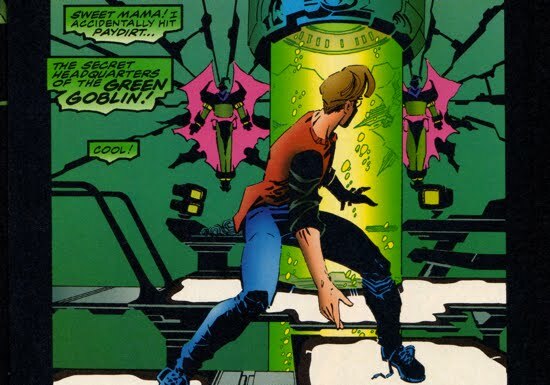 In the final issue of the Green Goblin series, Green Goblin #13, Phil’s (or should I say Harry Osborn’s) Green Goblin mask was damaged after he neutralized a Sentinel during the Onslaught Crisis. 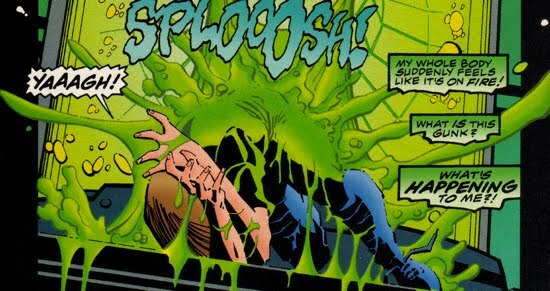 The damage had occured in Green Goblin #12. It turned out that the mask was crucial to his powers because it “supercharged his strength” and “flashed up his reflexes." Not to mention it generated a “lunatic laugh”, which was a sonic blast that kept his opponents off-balance. To add insult to injury, his uncle Ben informed him that he lost his position at the Bugle. After his friend Freddie Glazer was unable to fix the mask, he decided to continue his crusade without the powers. However, when he attempted to stop some muggers and failed; he realized his efforts were futile (thankfully Ben Reilly stepped in to bail him out). Phil realized it was best to leave the super human duties to those with super powers. He trashed the Goblin attire and decided to finish his college education. This was not the end of the road for Phil Urich though, for a summary of his life post-Norman Osborn's return from the 'dead' see here and here.